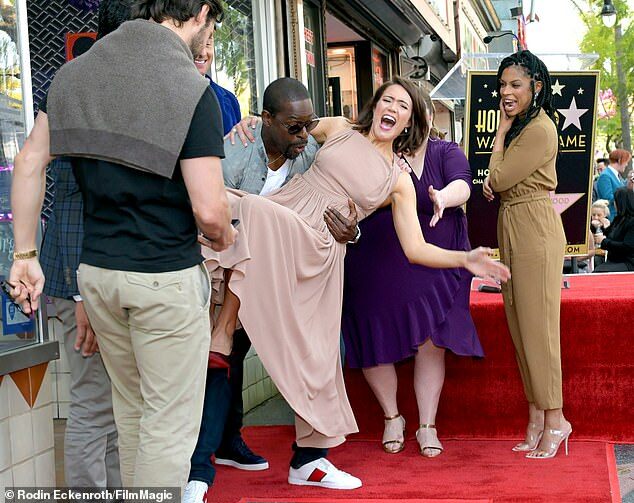 This Is Us star Mandy Moore got a 'lift' from her supportive This Is Us castmates during her Hollywood Walk Of Fame induction on Monday. Sterling K. Brown - who plays the 34-year-old actress' onscreen son - humorously picked the squealing star up over her newly-minted sidewalk star located at 6562 Hollywood Blvd. The former pop princess was 'excited and nervous' about the honor, which costs a $40K fee to the nomination committee. Don't drop me! Sterling K. Brown - who plays her onscreen son - humorously picked the squealing 34-year-old up over her sidewalk star located at 6562 Hollywood Blvd. 'I am so excited to be with all of you today,' Mandy gushed from the podium.